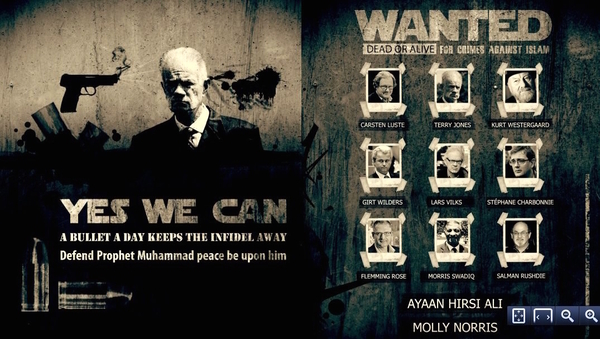 Inspire, the glossy, English-language internet magazine published by Al-Qaeda in the Arabian Peninsula (AQAP), published a "Wanted dead or alive for crimes against Islam" poster in its March 2013 issue. No one paid much attention to it, not until the commando-style murder of Stéphane Charbonnier, one of the eleven listed, on Jan. 7. The other ten are Ayaan Hirsi Ali, Terry Jones, Carsten Luste, Molly Norris, Flemming Rose, Salman Rushdie, Morris Sadek (misspelled on the poster as "Swadiq"), Lars Vilks, Kurt Westergaard, and Geert Wilders. "Inspire" poster calling for the murder of eleven Westerners. No one from outside the central regions of Western civilization seems to be worth APAQ's time: all eleven live in either the United States or Western Europe. Only born Christians and Muslims (Ali, Rushdie) are included in the list. No Jews, Hindus, Buddhists, et al. Three hail from countries long under Muslim rule: Ali from Somalia, Rushdie from India, Sadek from Egypt. Five live in the United States and six in Europe, of which three live in Denmark. Seeking refuge from their Islamist persecutors, two (Ali, Rushdie) moved from Europe to the United States. Islamists care much more about pictures than the written word: nine of the eleven have a pictorial dimension, six with cartoons (Charbonnier, Luste, Norris, Rose, Westergaard, Vilks) and three (Ali, Sadek, Wilders) with movies. One (Jones) engages in highly pictorial activities. That leaves only Rushdie with no pictorial aspect. Two of those associated with cartoons (Luste, Norris) are obscure bit-players whose inclusion, rather than high-profile anti-Islam activists, is surprising. In addition to murdering Charbonnier (and eleven others in his office), Islamists have physically assaulted two other cartoonists (Vilks, Westergaard). They also attacked and killed some of Rushdie's translators. All but three (Ali, Jones, Wilders) are associated with ridiculing Muhammad, the prophet of Islam. May 3, 2015 update: The armed assault on a policeman guarding a display of Muhammad cartoons in Garland, Texas, today confirms this pattern of caring most intensely about drawings. What To Do With Un-Deportable Aliens?